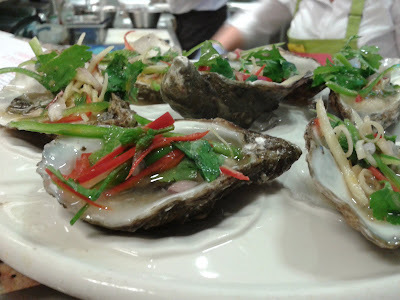 This post is a little late, as the Senses of Thailand promotion at Selfridges ends 30th July. Whilst I don't accept many PR invites, I couldn't resist this one. After all, Thai is one of my favourite cuisines. There's lots of great stuff at this promotion with the likes of Patara and @siam dispensing free samples. However, the highlight has to be the mash-up (look at me getting down with the kids) between Nahm and Selfridges Champagne and Oyster Bar, where special dishes devised by Nahm's head chef, Matthew Albert are available. 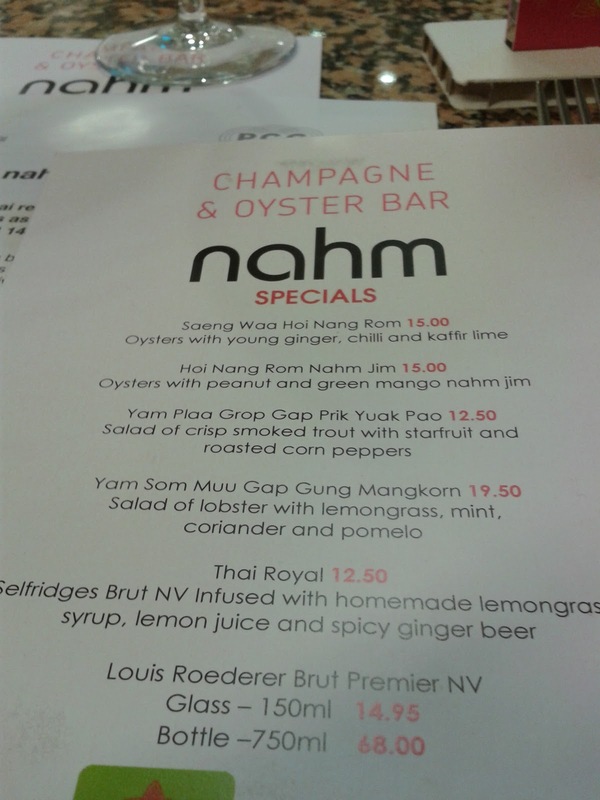 My favourite was the oysters with peanut and green mango nahm jim (hoi nang rom nahm jim). Apologies for the brevity of this post, but I'm going away on holiday – a proper one without the intrusions of the interweb. I'll respond to your comments and e-mails when I get back. The next post will be on August 8th. See you then. Long time readers of my blog will know that I am obsessed by Din Tai Fung (鼎泰豐) - I've even campaigned for them to open in London. So it was inevitable that when I was in Hong Kong, I would pop into their Causeway Bay restaurant, not once, but twice, to sample their world famous xiao long bao (小籠包) as well as some of their other treats. It goes without saying the xiao long bao (小籠包) are different class whether they're the standard pork ones or the blingier pork & crab variety (蟹粉小籠包). The elastic dumpling skins are so delicate yet there's seldom any leakage of soup. Of the other dumplings, I'm a big fan of the glutinous rice & pork shao mai (糯肉燒賣). In case you're wondering, these shao mai are Shanghai-style and differ from the more familiar Cantonese-style. Be warned though, the glutinous rice is quite filling. Less successful were the steamed mushroom & vegetable dumplings (香菇素餃). I guess I just don't like this style of dumpling. They're a bit indelicate for my liking and the filling wasn't much cop either. Whilst most of Din Tai Fung's offerings are either Shanghainese or Taiwanese in origin, there is the odd interloper like these tasty Sichuan-style chao shou (紅油抄手). These are essentially wontons in chilli oil, and they are proper spicy. The first time I had Din Tai Fung's steamed chicken soup (元盅雞湯) was in Shanghai. This rendition wasn't quite as good as I remembered but it's still well worth ordering. You can also order this with noodles, which come on the side, to make your own noodle soup. Din Tai Fung's Taiwanese roots are showcased by dishes such as fried pork chop (炸排骨). There was nothing technically wrong with this dish but there was too much five-spice powder for my liking. There's a wide selection of noodles but they were a bit hit and miss. One of the misses was the Taiwan-style dan dan noodles (台式擔擔撈麵). I found the sauce insipid with the peanut and sesame paste a bit overpowering. So much so, there was barely any heat. Perhaps this is how they like it in Taiwan. A much better bet for carbs are the fried rice dishes such as the shrimp & egg fried rice (蝦仁蛋炒飯). Other dishes that I can recommend include stir-fried greens and Shanghai-style cold starters. Incidentally, when ordering at Din Tai Fung – you need a strategy. My advice is to order some cold starters and a first batch of dumplings to kick off with – it is critical that you don't order too many baskets of dumplings in this first order, as they don't taste as nice if left sitting around. When the first batch of dumplings arrives, order a second batch along with any other dishes that take your fancy. You can of course order further batches of dumplings but always keep a stagger so that you can enjoy them freshly steamed. Whilst not every dish wowed, Din Tai Fung has a winning formula that fills both its Hong Kong restaurants with locals, expats, and out-of-towners on a daily basis. I'm also sure that it's a formula that would go down a storm in London. And indeed there was talk of Din Tai Fung setting up shop in London (and Paris) as far back as 2008, although I've heard nothing since. The thing is I could live with Din Tai Fung not being in London if it just operated in its native Taiwan with maybe a branch or two in cities like Shanghai and Hong Kong. But knowing that they operate around 60 restaurants in 10 countries does beg the question: why not? After all, there are 10 branches in Singapore, a city half the size of London. And it's not as if they operate solely in Asia, as there are two restaurants in Sydney in addition to those in Los Angeles and Seattle. Anyway, I have a plan. There are currently 11 branches of Ping Pong, a dim sum eatery for which I have scant regard, in London. My plan would see all of these become branches of Din Tai Fung. Overnight, dumplings of a higher order would replace Ping Pong's crappy dim sum. Unfortunately, I'm not an omnipotent London food tsar that can make these things happen, so I'm making an appeal to the owners of Ping Pong. Please can you guys make an offer to the owners of Din Tai Fung to become their UK franchisee? Now I know Ping Pong probably makes a fair bit of money, but by my reckoning Din Tai Fung can probably make you more. And not only that, just think of the respect and gratitude that you will get. Now I know I've been a bit rude about Ping Pong, but it's nothing personal. I just want to see a better class of dumpling in town. So what do you think, Ping Pong? In the meantime, let's keep the campaign for Din Tai Fung to open in London going – please drop them a friendly note by clicking here. Update June 2013 - For a more recent review of this restaurant - please click here. When I was kindly invited by Su-Lin to join some other foodie blogger twitterer types to check out the six-foot family dosa at Chennai Dosa, the answer was always going to be yes. Sometimes dishes like these are ordered for their novelty value rather than being any good, but in this case, I needn't have worried. I was lucky enough to sit at the end where the dosa had a crispier consistency, and I enjoyed tucking into this with potato curry and the various chutneys. We didn't quite finish it off but we had a pretty good go at it. There were other dishes too, and for Su-Lin's fuller account of the meal, please click here. There are branches of Chennai Dosa dotted around London, and we ate at the Ealing Road branch, which is pure vegetarian. This is adjacent to a non-vegetarian branch on High Road, Wembley. I've been doing a spot of moonlighting again – check out my guest post on The Grubworm. This is the last post in The Cantonese Season and to sign off, here are some images of two of the most beguiling foodie cities in the world. It's often said that the Kowloon side of Hong Kong is earthier than the Island side. That's certainly true of Temple Street night market, which attracts both locals and tourists with its mix of counterfeit goods, special interest adult DVDs, and tasty street food. As well as the seafood and hotpot restaurants with outdoor seating, there are also loads of little stalls selling stuff like meatballs, sausages, and fish balls on skewers. Despite having dinner plans, I couldn't resist a skewer or two. Guangdong province is home not only to Cantonese cuisine, but also Chiuchow or Teochew cuisine (潮州菜). This style of food is hugely popular in Hong Kong where dishes like poached goose in master stock (滷水鵝) have become local favourites. Sadly, other than the goose and a few snacks, I didn't get to really sample much of this cuisine, as we went to Chiuchow Garden for dim sum. However, we did get to finish our meal in the traditional Chiuchow way, with some kung-fu tea (工夫茶). HK-style western food is a law unto itself, and these lunch specials at Tsui Wah had me scratching my head. Does anyone know what Cream of Queen soup is? How about Chicken Macmillan? As we had a bit of time to kill before dinner at The Chairman, Tom took me to Cantopop. Without sounding too pretentious, this is a 21st century cha chaan teng (茶餐廳). We just had beer and snacks, but looking back I wish we had ordered some sous-vide cha siu. Despite building an extensive underground metro, carving out express bus lanes, and banning motorbikes, Guangzhou's traffic is still terrible. Perhaps this bike-share scheme is the answer. I kid you not, but my first port of call in Guangzhou was the fish market. The Huangsha Aquatic Products Market (黄沙水产交易市场) is one of the busiest in China, if not the world. The market is open for wholesale and retail, and there's lots of weird and wonderful stuff to see. I was especially drawn to the geoduck or elephant clams (象拔蚌). There are quite a few seafood restaurants in the market complex, and we pitched up at one for a spot of lunch. We kicked off with some whelks and other highlights included scallops, steamed fish and abalone. Are you reading this, Matthew Norman? I ate loads of greens on this trip. I particularly enjoyed the vegetables in Guangzhou although I couldn't remember what many of them were called. Sweet & sour is often seen as cheap and nasty but these posh sweet & sour spare ribs (生炒排骨) are a far cry from the No.27 at the local take-away. Not only were they served in a rice vermicelli nest but also there wasn't a single pineapple chunk in sight! Alas, this is the end of The Cantonese Season. If you want to catch up on earlier posts, click here and scroll to the end for links. I'd also like to take this opportunity to thank family, friends and colleagues for their invaluable input. Many London-based bloggers have also been to Hong Kong in the last year or so. If you're just stopping over for a couple of days then An American In London's succinct 48 hours of Eating in Hong Kong is a great guide. For those of you spending more time in Hong Kong, Hollow Legs and Pig Pig's Corner cover a lot of ground between them. As does CheChe's Blog on her recent series of posts. By the way, the English words: 'hello' (haa lo) and 'bye bye' (baai baai), have both entered into the Cantonese vernacular. Indeed, there are many English loanwords in Cantonese. For those of you that can speak a bit of Mandarin, this will be of more use in Guangzhou than Hong Kong. This is the penultimate post of The Cantonese Season, and it features my favourite meal of the whole trip. Sorry Hong Kong, but the honour goes to a very special restaurant on the outskirts of Guangzhou! Back in the day, Dashi (大石), which means 'Big Rock' in English, was a small village located between the cities of Guangzhou and Panyu. Nowadays, it's been swallowed up by the urban sprawl but there remain a few signs of its rustic past such as 花好悦园酒家 (there's no English name but the translation is something like 'Delightful Garden of Good Flowers Restaurant'). Upon arriving at this restaurant, you could be mistaken that you've strolled into a market, as there are displays of vegetables and seafood, as well as rows of fish tanks. Walk further in, and there are open kitchen stations each devoted to their own speciality such as the steamed bun station. Ordering is also done differently. You literally walk around the market area with your server, and select fish, seafood, and vegetables to be cooked in the style of your choosing. For other dishes, you can visit the various kitchen stations to see if you like the look of the food. For example, from the rotisserie station, we ordered this juicy and succulent roast goose (燒鵝). It saddens me that this dish is seemingly impossible to find in the UK. The Cantonese love chicken, and popular styles of cooking include white-cut chicken (白切雞), soy sauce chicken (豉油雞), and crispy fried chicken (炸子雞). But one style that isn't as common is roast chicken (燒雞); this particular one was honey-basted and I loved the crispy skin. The rotisserie station get top marks! In addition to the market area and the open kitchen stations, the restaurant proper consists of a normal indoor dining room and a covered 'outdoor' area (monsoons are not uncommon in this part of the world). We bagged a table in the outdoor area, right by the lily pond. Steamed fish is always a popular choice to take centre stage in a Cantonese meal. In this case, it was steamed dace (清蒸土鯪魚) aka Chinese mud carp. I'd never eaten fresh dace before, and it was a revelation. It helped that it was just cooked. Of all the dishes that I ate on this trip, the fish-skin dumplings (魚皮餃) stood out as my favourite. These are essentially wontons with a fish-skin wrapper and a filling of pounded fish meat. I also liked the broth (non-fishy) and the vegetable that it was served with. Apologies, but I've forgotten the name of this veg that bears some similarities to water spinach or morning glory (蕹菜 ong choi). I had a feeling that this stuffed tofu (酿豆腐) dish was special when I saw a whole kitchen station devoted to making it. I'm not a tofu man but everybody else was raving about it. I still have dreams about the braised goose with taro (芋頭燜鵝) and the amazing light citrusy gravy that it was served with. This was a perfect combination especially with the taro soaking up the gravy. Of the two goose dishes, I preferred this one. We had lots of vegetables at the table, and my Mum, revealing her inner-blogger, insisted that I take a photo of the green aubergine (青茄子). As she rightly pointed out, these are seldom seen outside of Asia. These mashed sweet potato cakes (番薯餅) were fluffy inside yet crispy on the outside. I forgot how much I liked these until I saw the photo again. Sweet potato is very common in southern Chinese cooking and is eaten in addition to the more usual accompaniments of rice and noodles. Never let it be said that the Chinese don't do desserts. Pineapple buns or bolo bao (菠蘿包) don't normally contain any pineapple (the name comes from the cookie-like topping that resembles the outside of a pineapple). These did though, with a delicious pineapple jam filling. The other dessert was a hand-made black sesame paste (芝麻糊) – also tasty. Cantonese cuisine has many faces, not all of them pretty. Take, for example the use of unethical ingredients, MSG and mass produced additive-laden sauces. That's why it's important to champion the simple rustic approach of restaurants like this one (and The Chairman in Hong Kong). However, worthy principles count for little if the end product doesn't deliver. This does, and from start to finish, it was a meal to remember. It goes without saying that you should visit this restaurant if you can. Alternatively, I can forward a pdf copy of their business card with a map and directions in Chinese if you contact me by e-mail.